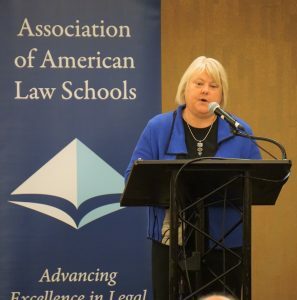 I want to begin by saying, first and foremost, thank you for your support during my year as AALS President. I have been able to meet with many of you and visit many of your schools. One thing this year has done is make me even more confident in the future of our legal academy. I stand in admiration of the way that our law schools are responding to a very challenging environment, and responding with the kind of help that our world desperately needs and craves. When I chose “Why Law Matters” as my theme last year, I was choosing something that I believe in from my life experience: the importance of the rule of law for human flourishing. I am personally devoted to seeking justice through law. Little did I know, as time went by, how the events of our day would make that theme even more relevant. I want to thank you for the great work you’re doing in the service of law and justice. What we do is needed in our world now more than ever. We can help bridge change and stability. Law can help guide us to peace, justice, and an environment where everyone, especially those most vulnerable, can find a way to flourish. More than anything, I want to thank you for what you do and call you to keep doing it. We need you now. I hope you feel good about what you’re doing. I believe in our capacity to continue promoting the role of law and justice in our world. Thank you for what you’re doing. I look forward to continuing the work with you. I want to mention a couple of things that I hope we continue to strive for as an academy. One of those is that we, through our work as scholars, need to continue to be a place of ideas. Our world is going to need creative solutions and new ways of thinking. That’s what scholarship does: helps open up a space where we can think and have the privilege of saying what we think. We all must continue working to cultivate the kind of environment in our institutions and in our world where we have the space and protection of academic freedom to talk about what matters in law and policy. AALS is known for its core value of faculty scholarship. I look forward to joining with you to continue to work in that vein. I also want to encourage all of you, as you move forward in legal education, to know that though there is already much innovation happening in our schools, we will need to see more and more of it. Our world is rapidly changing through many forces. We’re going to need to continue to be creative about the kinds of education we’re delivering to make the work we do in law more broadly understood. This year, I was struck by how many people said they, too, believe “Why Law Matters” is not well understood. That too many in our world, when they think of law, think only of police, criminal justice, or something even more narrow. But law is the very system that creates the ecosystem for all of us to flourish. We will need to think about how we can better contribute not only to helping young people understand the role of law, but to helping everyone understand it and its potential for justice. I look forward to talking more about that as we move forward. Finally, before I turn this over to Judy Areen, I want to note that my work as president has deepened and broadened my great respect for this organization. The staff of AALS are committed to supporting the legal academy. Each person there is devoted and hardworking, they believe in us, and they believe in the work that we’re all doing together. I want to thank them from the bottom of my heart, and to thank Judy Areen for her leadership. AALS is needed in our academy, and I hope you all continue to join with me and gather together annually to support the great work of the association.